Lena Brooks, a Partnership Manager from Waltham Cross Jobcentre Plus, Department for Work and Pensions (DWP) took on an exciting role to project lead a six week employability programme for 28 year 9 students (13 and 14 year olds) from St Mary's Church of England school based in the heart of one of the most deprived wards in Waltham Cross. I went with Lena, the project lead from DWP, to discuss the project with St Marys Church of England High School. We decided that instead of delivering our standard Engaging our Schools Programme to year 10 and 11 students, the year 9 students would find it useful to have a bespoke programme designed to enable them to make informed choices about what GCSE's would help them achieve their desired career goals. We agreed to include some of the elements of the original Engaging our Schools Programme such as CV's and mock interviews and wanted to give the students an opportunity to visit some of the local employers premises for their workshops to take place. We all felt that this model would be better suited to the year 9 students needs, bringing the public and private sectors to work together for the benefit of young people in Waltham Cross. The students were taken into the Council Chamber, introduced to several Local Authority employees who spoke to them about their experiences and career paths. They talked about their roles at the council offices and how they applied for their posts. They talked about what the students need to focus on in their studies, how to apply for Local Authority opportunities and their extensive Apprenticeship programme. This was hosted at the Youth Connexions centre. A Youth Connexions adviser took the group through the service they deliver for 13 – 19 year olds, in particular the service they offer within their school. The adviser also gave them an insight of the National Apprenticeship website and how to register and introduced the group to an IT tool that allows students to put in their skills and strengths they have. When completed it gave them an idea of the types of jobs that would suit them and the minimum qualifications they need to apply for them. The adviser talked about the Youth Connexions service for young people in the locality and Hertfordshire in general. The biggest Housing Association in the area talked about the Apprenticeship programme they support the types of roles they have and what skills are needed. They also had three apprentices that studied at St. Marys School and how they found out about the apprenticeships and what they needed to do to apply for the post. They talked about what they are doing now and how they are hoping to progress their career path. They talked about the community Projects they are involved in and how the Housing Association supports communities within the borough. They explained what training programmes they deliver within the community and the support they offer their residents. 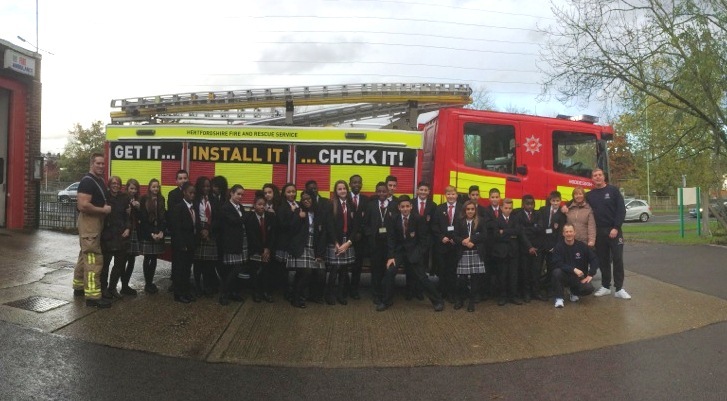 This was held at the Cheshunt Fire Station as the Princes Trust programme is delivered by Hertfordshire Fire and Rescue service. The Group leaders talked about their young person programme, aimed at 13-24 year olds and looks to develop team working, confidence building, mock interviews, putting together a CV and communication skills. They covered how the Fire Service recruit and the skills required to become a fire fighter. The group then had two fire fighters cover fire safety, general well being, the affects of hoax calls and how they can affect the ability to attend real incidents where lives could be saved. The group undertook some fun activities with the fire and rescue equipment and got to go on a fire engine. This session was delivered at the school and was the last session for the students. We started the session looking at Social media safety, delivered by way of quizzes and asking the students what they knew and their experiences. We also covered the effects of Social Media on and employer and what they look for. General Do’s and don’ts of social media and how to keep themselves safe using Social Media. They covered what Tax and National Insurance contributions are, why we pay them and where it goes – which turned out to be a very lively and interactive session. Then they looked at the wider Civil service roles, where to look for advertised jobs, how to apply as well as what you need in the way of qualifications. It covered the types of very different civil service departments and the roles they play within the local community. Apprenticeships and the Fast Tracj apprenticeship routes were a key feature of the discussion. The students found the programme enjoyable and now have a better idea of the types of opportunities available to them in Waltham Cross, giving them the tools and ideas to gain future employment opportunities. St Mary's Church of England High School and Waltham Cross Job Centre are now planning to deliver the programme to a new set of students. It would be great to see civil servants from other departments joining the projects. If you would like to get involved in taking part in helping students in Waltham Cross or across Bedfordshire and Hertfordshire, please contact donna.donaghey@hmrc.gsi.gov.uk or ian.barton@csresourcing:gsi.gov.uk for further information.